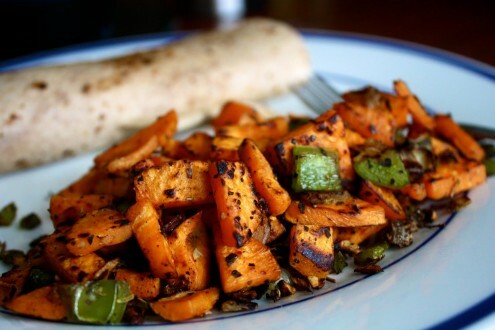 Sweet potato hash | Naturally. During the beginning our relationship, Mike was a fast food junkie. I know, I know- I really shouldn’t be so harsh to him but sometimes the truth hurts! I mean, why not eat fast food every day—it is cheap, easy, and delicious (well to some people.) So when started dating, I slowly added home cooked meals to his day. Eventually (when we moved in together) he ate less and less fast food. However, there are still times he gets a hankering for one of his old favorites and this morning he wanted one thing—breakfast burritos from McDonald’s. Well, at any rate; drum roll please! Homemade breakfast burrito and hash browns! Well egg white burrito in a whole-wheat tortilla accompanied by sweet potato hash. Did I win? I think I did! The burrito also had peppers, onions, fresh cilantro, cheese, and topped with a little Tabasco. Who needs McDonalds when you can have fresh cilantro in your burrito! Heat olive oil in a skillet over medium heat. Add sweet potatoes and saute until slightly softened. Add onions and peppers and continue to saute until potatoes begin to brown and onions are soft. Add seasonings to taste and saute for another 1-2 minutes. now…that’s a new one! WOW…going to try it. Love the bright color and sweet potatoes are a favorite. I think some over easy eggs on top of the hash itself would be just great! Eggs on top would also be amazing. I may have to go back and try that myself! I just discovered your blog and have to say, I love it! I’ve bookmarked a couple of recipes already. Keep up the good work. 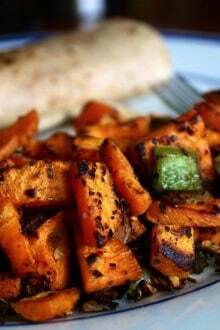 This sweet potato recipe looks delish. I love the (I’ll just date myself) record “Annie get your gun” I used to listen to it all the time when I was a kid – it was my go-to album for cleaning my room.